Cupcakes have always been popular with children, but in recent years they have been gaining ground with adults. Cupcake bakeries are sprouting up all over the country, elevating cupcakes from a child’s snack to an elegant dessert for grown-ups. However, they are easy enough to bake yourself and you don’t need a bakery to make them special. Just a little extra effort will make your cupcakes unforgettable. Filling your cupcakes is the easiest way to make them more sophisticated. Simply fill your cupcake tray halfway and then add your favorite center and cover it. Jams, peanut butter, cookie dough, fudge, or cream cheese are just a few of the possibilities. Sprinkles are the traditional cupcake topping, but edible glitter gives cupcakes an edge. You can also put something on top of your cupcakes that hints at the filling inside. For example, if you are making a chocolate chip cookie dough cupcake, add a mini cookie to the top. Gone are the days when applying icing with a knife was sufficient. A pastry bag and assorted tips are needed to really dress up your cupcakes. A decorative swirl looks beautiful and is a great canvas for toppings. To use less icing, try using a star tip in your pastry bag and dotting small or large stars to top your cupcake. These simple tips will make your cupcakes standout. By adding a variety of fillings, toppings, or decorations you can make a delicious grown-up dessert. If it’s holiday time, it’s baking time in my kitchen. 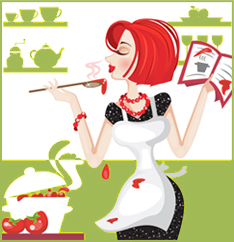 My friend Susanne (The Hillbilly Housewife) created an instructive collection of baking books. I’ve used them often. 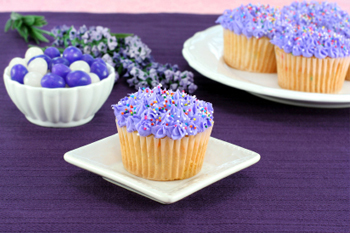 Here is a favorite cupcake recipe I like to fix for Easter. It comes from Martha Stewart’s Baking Handbook . I always fall back on Martha!! Line two standard 12-cup muffin pans with paper liners. Transfer pans to a wire rack to cool for about 5 minutes. Remove cupcakes from pan and allow to cool completely.